Last month, I talked about a few of the liturgical changes you may have noticed in church, recently. This month, I’d like to talk about another regular change that you may have noticed: our forms for the Prayers of the People are a little different every week! Our Episcopal Church, and the Anglican tradition that forms us, is based on “common prayer”. This is the idea that it is our prayer that unites us - more than any creed or belief or ideology. 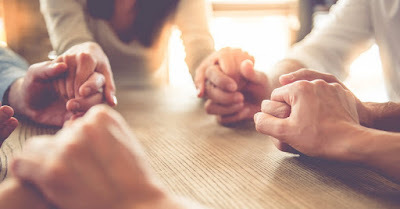 Even when personalities and perspectives might divide us, the praying, which shapes our believing, is the core of what it means to be an Anglican and an Episcopalian. There are a lot of different forms of prayer and worship that fall within the bounds of common prayer. Within our own Prayer Book there are six specific forms of Eucharistic prayers that we follow most often, but even beyond that there are two forms that allow for more free expression, and another section for “Communion Under Special Circumstances” that gives only an outline of what should be said. That is to say nothing of the orders of Morning and Evening Prayer, and supplemental and international liturgies available to us. That being said, one of the areas where we’re most encouraged to creatively explore different avenues for prayer is through the Prayers of the People. The guiding rubric (instruction) in the Book of Common Prayer about the Prayers of the People simply tells us who and what we should pray for: the Universal Church, its members, and its mission, the Nation and all in authority, the welfare of the world, the concerns of the local community, those who suffer and those in any trouble, and the departed. (BCP p. 383) The rubrics specifically call on us to alter the prayers to fit our needs and contexts. Since Easter Day, our prayers have come from a fairly new (2014) resource from the Episcopal Church called Praying the Scriptures. This book was written by a friend of mine, the Rev. Jeremiah D. Williamson, who was raised up for ordination here in the Diocese of Newark. His goal was to give our prayers deeper unity with our lessons and celebrations each Sunday. He wrote petitions and thanksgivings for each Sunday of the three-year liturgical cycle to be in compliance with the rubrics of the church, while also specifically complementing the lessons of the day and the spirit of the season. In his preface, Jeremiah says, “I believe every prayer is a poem - words strung together between the human heart and the heart of God.” I believe this, too. My hope is that we will hear this moment in our weekly worship - the moment when we most intentionally try to unite our hearts with the heart of God - in a new way with renewed energy. Prayer can be an opportunity for us not just to talk to God, but to actually listen to God. It’s not just one of the boxes we check in executing our worship, but a real opportunity for us to grow. As we take this journey together, let me know how you hear these prayers, and if they help you to hear God more clearly in our worship!